The Hypercarnivore Diet: Study: "Those with a lower cholesterol experienced a higher mortality than those with a higher cholesterol." Study: "Those with a lower cholesterol experienced a higher mortality than those with a higher cholesterol." The full text of this report is behind a pay wall, so I haven't read the whole thing. Nevertheless, I have comments on the contents of the abstract, assuming it correctly represents the data collected. "Those with a lower cholesterol experienced a higher mortality" mostly from cancers and two respiratory diseases: tuberculosis and cor pulmonale. Most advocates of the cholesterol hypothesis explain away this association not by saying it does not exist but by attributing it to reverse causality. Their idea is that cancer and respiratory disease processes reduce serum cholesterol. I previously uncritically accepted the reverse causality hypothesis myself. However, I now believe I was wrong to do so. If you accept the reverse causality hypothesis, then you must believe that in this group of 11,121 men, there existed a large number of individuals who had undetected cancer and respiratory diseases (pulmonary tuberculosis and cor pulmonale) at baseline, which diseases were causing those individuals to have low serum cholesterol. You have to believe that the physicians who examined these subjects at baseline were not doing their jobs very well. "Cor pulmonale is a common type of heart disease, as a result of its close association with COPD which has emerged, in recent years, as a leading cause of disability and death." Chronic obstructive pulmonary disease (COPD) is the most common cause of pulmonary hypertension and cor pulmonale. It seems unlikely that the physicians who first examined the subjects of this study failed to detect COPD or a high risk thereof in subjects who were declared healthy at baseline but within 7 years died from cor pulmonale. Further, you have to accept that this Yugoslavia Cardiovascular Disease Study data supports this premise: Low cholesterol in an otherwise apparently healthy individual is a possible or probable sign of occult, not-yet-discovered cancer, tuberculosis, or chronic obstructive pulmonary disease. This puts advocates of the cholesterol-heart hypothesis in a bind. They maintain that low cholesterol is health-promoting, because it reduces your risk of cardiovascular disease mortality. Yet as soon as they postulate their reverse causation explanation for findings like this, they are also asserting that low cholesterol may be a sign of undiagnosed cancer, tuberculosis, or chronic obstructive pulmonary disease. So, which is it? Is low cholesterol a sign that you are healthy and destined for a long life, or is it a sign you are or may be very sick and on the verge of death from cancer or respiratory disease? From the perspective of a student of philosophy of science like myself, this type of contradiction signals that the reverse causality hypothesis is an ad hoc hypothesis. The Latin phrase means "formed, arranged, or done for a particular purpose only." In this case, the purpose of the reverse causation hypothesis is to save the cholesterol hypothesis in the face of data that contradicts or refutes that hypothesis. Has anyone ever produced convincing evidence – not just a convincing hypothesis – that the finding of higher mortality from cancer and respiratory diseases in this specific population was just a result of the failure of the involved physicians to detect latent cancer, tuberculosis and cor pulmonale in the individuals involved at the baseline examination? No. It would be impossible to do so, as providing such evidence would require turning back the hands of time, and re-examining all subjects at baseline with every tool available in order to detect or rule out latent cancer, tuberculosis, and cor pulmonale. You would have to provide evidence that at baseline these people who had low cholesterol had or were on the path to having those diseases and that those diseases were the cause of their having low serum cholesterol at baseline. Only then could you say with confidence that the low cholesterol levels of those who died from cancer or respiratory diseases were caused by those diseases. Since we are not able to travel back in time to confirm the reverse causation hypothesis, it is an in principle not testable, ad hoc hypothesis. If your hypothesis is not testable by experiment, its not empirical science. The reverse causation "explanation" has two purposes. First, it is designed to relieve cognitive dissonance among proponents of the cholesterol hypothesis when they encounter evidence indicating that people who have supposedly healthy low serum cholesterol have an increased risk of death. Second, it is designed save the lipid hypothesis from contrary evidence. The people who postulated reverse causation to explain away the findings that are contrary to the lipid hypothesis are attached to the cholesterol hypothesis as an explanation for cardiovascular disease. They have difficulty entertaining the possibility that they are wrong about cholesterol, especially if their income depends on sales of cholesterol-lowering drugs. They don't want to consider the possibility that their campaign to lower cholesterol may make some people more susceptible to cancer, respiratory diseases, or other maladies, and wipe out any benefit gained in reduced risk for coronary heart disease mortality. The mind wants to be right and righteous. Many people have great difficulty admitting they have erred, whether in matters of fact or matters of morality. It is hard to lose face (speaking from plenty of experience). You see, the alternative is to entertain the possibility that this and a large amount of other research suggests: that having low cholesterol makes one more susceptible to mortality from cancer or respiratory diseases. And also the possibility that people who have very low cholesterol might have a low rate of death from cardiovascular disease because they are more likely to die of cancer or respiratory diseases first. Thus, from Campbell's point of view, according to the above report from the Yugoslavia Cardiovascular Disease Study, Slavic men who have low cholesterol have a greater mortality from both two diseases of affluence – cancer and cor pulmonale – and a disease of poverty – pulmonary tuberculosis. But according to Campbell, most diseases of affluence are caused by eating animal foods and consequently having high serum cholesterol. In other words, according to Campbell's hypothesis, the Slavic men who died of cor pulmonale should have had high cholesterol at baseline, not low. And from the other angle: Who wants to trade dying relatively young from tuberculosis, as an alternative to dying from coronary heart disease when old? Most deaths from coronary heart disease happen to people who are well past 65 years of age; while according to WHO, "Tuberculosis mostly affects adults in their most productive years." If it is a fact that high serum cholesterol is more common among people who die of coronary heart disease, or those that have progressive atherosclerosis, and even if it is true that high LDL accelerates the progression of atherosclerosis, this doesn't directly imply that high serum cholesterol is the cause for the atherosclerotic process. Everywhere you find a cut, you find a scab. Does that mean that scabs cause the cuts? Of course not. Atherosclerosis is like a scab. Cholesterol is needed to make these scabs, but what makes the artery need a scab? There exists evidence that lipid-reducing drugs like statins are anti-inflammatory. Although statins have a direct effect of reducing the liver's cholesterol production by inhibiting HMG-CoA reductase, it also appears that by reducing inflammation, they reduce the peripheral tissue's demand for cholesterol from the liver. "The observed benefit of statin therapy, however, may be larger in these trials than that expected on the basis of lipid lowering alone. Emerging evidence from both clinical trials and basic science studies suggest that statins have anti-inflammatory properties, which may additionally lead to clinical efficacy." "Despite large reductions in cardiac event rates, the absolute angiographic change in arterial narrowing observed with statin therapy is small . Second, several trials suggest that the observed clinical benefit of statin therapy is greater than that expected on the basis of low density lipoprotein (LDL) reduction alone"
We have evidence that inhibition of HMG-CoA reductase directly inhibits inflammation by reducing macrophage secretion of metalloproteinase (MMP), which in turn improves the stability of atheromatous plaques, which reduces the risk of thrombosis and myocardial infarction (heart attack). "Numerous studies suggest important effects of statins on macrophage function. Macrophages are capable of degrading the extracellular matrix and, by secreting matrix metalloproteinase (MMP), may weaken the fibrous cap and thus predispose an atheromatous plaque to rupture. Fluvastatin and simvastatin have recently been shown to inhibit MMP-9 (gelatinase B) activity and secretion by macrophages . This effect is reversed by the addition of mevalonate, suggesting that it is mediated by HMGCoA reductase inhibition." Hence it is possible that elevated high-density LDL cholesterol and the laying of atherosclerotic lesions are responses to inflammation. In which case cholesterol does not cause atherosclerosis, it merely participates in a process which the body uses to cope with inflammation. "Sugary foods, notoriously bad for your teeth, also may be bad for your blood vessels and many other areas of the body, University at Buffalo endocrinologists have found. "Their study, published in the August issue of The Journal of Clinical Endocrinology and Metabolism, shows that excess sugar in the bloodstream stimulates the generation of free radicals, the oxygen molecules known to damage cells lining blood vessels and many other organs. "To test his hypothesis, Dandona and colleagues selected glucose, the nutrient with the most direct impact on diabetics. They gave 14 healthy men and women who had fasted for 12 hours a drink composed of 75 grams of glucose -- the simplest form of sugar -- dissolved in 300 milliliters of water -- a little more than one cup. This amount of glucose is roughly equivalent to the sugar content in two cans of a cola drink, Dandona said. "Another six participants, who served as controls, drank a water-saccharin solution. Researchers took blood samples from all participants before the glucose challenge and at one, two and three hours after. "Results showed there was no change in free-radical generation in samples taken from controls. However, in samples from subjects who drank the sugar water, free-radical generation increased significantly at one hour and more than doubled at two hours. The analysis also showed an increase in the key protein component of an enzyme that promotes free-radical generation. "At the same time, levels of a-tocopherol, the active form of vitamin E and a powerful antioxidant, fell about 4 percent by hour two and remained depressed at hour three." The typical physically active male needs at least 2500 kcal per day. If his diet is just 50% of energy from carbohydrate, he is getting 417 g of glucose daily. Spread over 3 meals, that is 139 g of glucose at a meal, 64 g more than tested in this experiment. 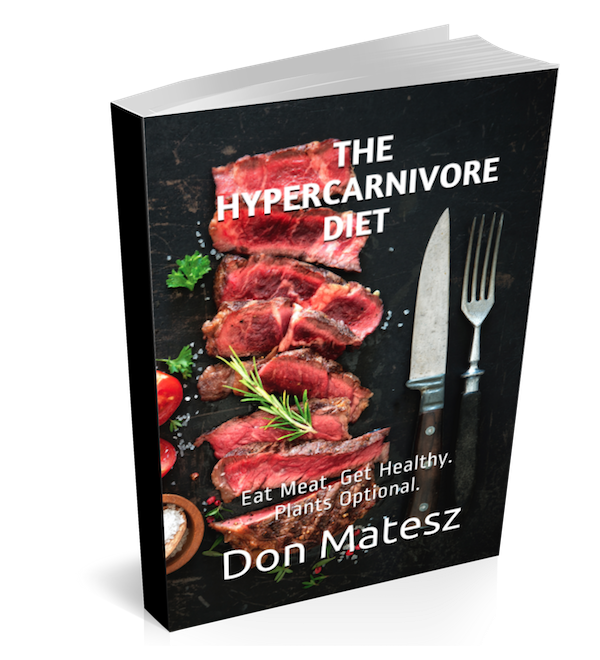 The problem is, many people have a really hard time thinking of whole grains, legumes, and starchy vegetables as packs of sugar. I know that I did. But that is what they are. As soon as you put any whole food starch in your mouth, your salivary amylase immediately starts converting it to the simple sugar glucose. Thus a significant portion of the starch you eat is already turned to simple sugar – glucose – before it even reaches your stomach. Then, when whatever is left makes it into the small intestine, the pancreas releases more amylase to make sure that it is all converted to sugar. This is not controversial. It is a simple, well established fact of human physiology and biochemistry. Therefore, dietary carbohydrate is dietary sugar. An 80% starch diet is an 80% sugar diet. That's a simple biochemical fact. Anyway, back to the abstract. The Yugoslavia Cardiovascular Disease Study appears to have produced evidence that casts doubt on the idea that reducing cholesterol is desirable, and the ad hoc reverse causation hypothesis does not and in principle can not save the cholesterol hypothesis from this challenge. 1. Weitzenblum, Emmanuel. “CHRONIC COR PULMONALE.” Heart 89.2 (2003): 225–230. Print. 2. Campbell TC, The China Study (BenBella Books, 2006), p. 76. 4. 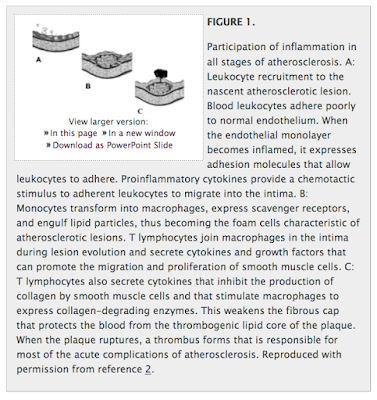 Libby P, "Inflammation and Cardiovascular Disease Mechanisms," AJCN 2006 Feb;83(2): 456S-460S. 5. Blake, Gavin J, and Paul M Ridker. “Are Statins Anti-Inflammatory?” Current Controlled Trials in Cardiovascular Medicine 1.3 (2000): 161–165. PMC. Web. 10 May 2017.